Creamy, dreamy and delicious, these overnight oats make the morning so easy. Just grab and jar and a spoon and hit the road! If you want to serve to guests, you can dress them up with a few more fresh chopped peaches, a drizzle of honey and a sprinkle of cinnamon. Either way, you'll be glad you did it! You guys, I finally did it!!! 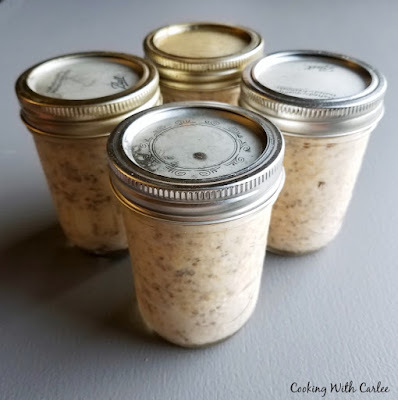 After months and months of yammering on about how I really want to make overnight oatmeal and how I really should make overnight oats and gee whiz if only I could get myself to make some overnight oatmeal... I finally made overnight oatmeal! I am not sure if this deserves a gold star and a pat on the back or a kick in the pants and a what the heck took you so long?! Maybe a little of all of it. No matter what, I am proud of myself! The funny thing is overnight oats are really not a new thing to our family. One of my favorite things to make when I was a wee little one was some porridge type recipe from a kid's cookbook. MiMi swears it was a Pooh Bear book of some sort, I would say it was possibly a Care Bear book. Apparently it must have had some sort of bears in it. Either way, we loved the recipe and it was one I could make on my own. If memory serves me correctly it used berry yogurt, oatmeal, some fruit juice and possibly a bit of honey. You mixed it all together and let it sit in the refrigerator over night. In the morning you had a big bowl of deliciousness waiting for you! I loved the cool creamy texture that it had. I also loved that the oatmeal still had just a bit of texture. I've never liked my oatmeal cooked to mush. I prefer it a bit more al dente. I don't want it dry, but I do like to have a little something to chew. After spending an entire afternoon scouring my parents' house for the mystery possible bear related cookbook, we never did find that stinking recipe. We even did some poking around on line trying to use every keyword we could think of and we never found anything that seemed right. So if you happen to know what book we are looking for or the recipe we loved so much, you would be a lifesaver if you would share! With a lack of "THE recipe" I had to forge on with something else. I have to buy bag after bag of peaches this time of year, I just can't help it. But they don't stay good too long. So rather than let them get soft, I use them in everything I can think of. Of course we love them in baked oatmeal and breakfast cakes, but there's not always time for those. So overnight oatmeal is the perfect solution. As the peaches go out of season, you can swap them out for any fruit or toss in some frozen. The possibilities are endless! If making 1 serving, mix together all ingredients in a jar. Cover and refrigerate overnight. Grab the jar and a spoon in the morning and go! If making multiple servings, scale up the recipe and mix together in a large bowl. Spoon into jars, cover and refrigerate until ready to serve. 1. It is delicious topped with a bit more fresh fruit, a drizzle of honey and a sprinkle of cinnamon. 2. You may want to use a pint sized jar rather than the smaller jelly jars. These were filled pretty close to the brim! 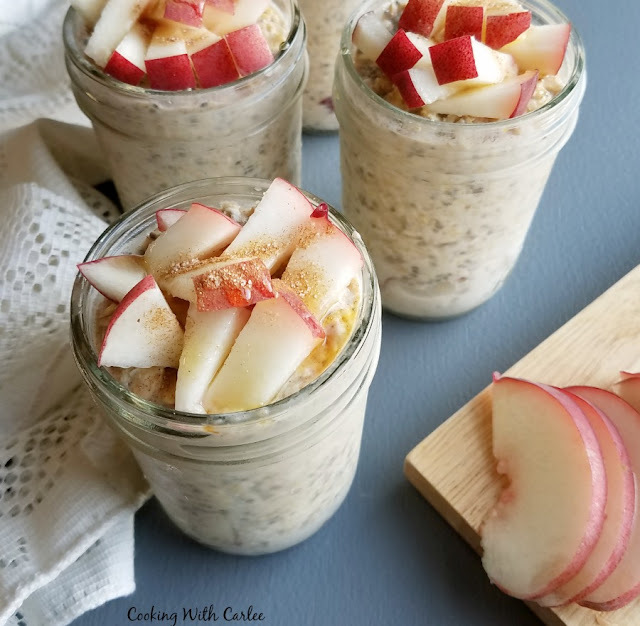 You know I am a fan of oats and with peaches being a favorite summer fruit of mine, well, this is perfection in a jar!!! Happy Monday pretty lady!! Aren't they great? Thanks, Andrea! Kelsie has a decent suggestion of the book it may be in... I'll send you a link and see if the cover looks familiar to you. I can't find a recipe index anywhere. This will be a great way to send the kids off to school. Love that it's made the night before. It makes mornings so much easier! 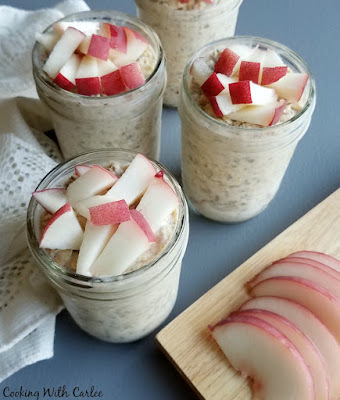 I've never tried overnight oats before but these sound like a great recipe to try for my first time! You definitely should. It would be a great grab and go breakfast or snack for the tractor too come harvest time! I love the way you found this recipe! Sounds like something that would happen in my home. My daughter and I have a favorite recipe from one of her American Girl recipe books. I will give this recipe a try - we have about 20 pounds of peaches right now! Just send some of those peaches my way! Some of those kids cook books have some pretty good recipes. Carlee, sounds wonderful - I'm glad you finally got around to it! :D Sounds like you love peaches as much as I do. Must make this soon. The book wasn't KidsCooking was it? There's a bear on the cover, and it was my go-to cookbook as a child :). I tried to find a link to it but it must be waaaay too old, haha! I'm so glad you finally made yourself some overnight oats! They're one of my favorite breakfasts, and I love the sound of adding peaches to them! My mom and I both did some searching and we don't think that's it. Thanks for the suggestion though... it led me to look at a lot of kids' cookbook indexes on Amazon. No luck yet, but we'll keep trying! I do too. I have no idea why I don't make them more! So easy, not sure why I've never made them before. I need to do better at eating breakfast on weekdays and this is the perfect way to do that! I should do better as well! These are so good and so easy I am not sure why I have such a hard time following through on making them more! I forgot about overnight oats! Thanks for the recipe! Sharing on Twitter.Thank you for sharing on Merry Monday! Hope to see ya next week! Yay! I keep telling myself I need to get in the habit of making them more too! Thank you! Well, I'm going to give you a gold star and a pat on the back! Doesn't it drive you crazy when you can't find something!?! I'm glad that you figured out a recipe in spite of not being able to find what you were looking for. Thank you for sharing. I hate it that we can't find it! I guess it gives us a mission though. Thanks, Amy! Thanks, Deepika! It is definitely great for a summer day! Peaches are awesome! I have to try this. I'm always forgetting breakfast. I need to be better about making big batches of stuff like this on the weekend so I can just grab and go during the week!